Yesterday was great for taking a few snowy photos, so had a walk through Burton, then up the footpath at the Square, going up alongside the old Royal Pub, turning right at the top and making way SE to nearby Dalton Hall. Then up the small lane to the village of Dalton, coming back via Vicarage Lane. 1) First photo is just after leaving the main road (just after Dalton Hall and heading up the lane towards Dalton Village. 2) The photo top right is of the older buildings at Dalton. 3) Just could not resist this sheep in the grounds of Dalton Hall. 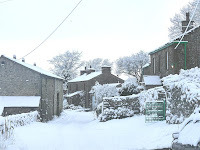 4) Above right is Clawthorpe with Farleton taken from Vicarage Lane. 5) Hutton House almost opposite the Kings on the Main Street in Burton. They say that Bonnie Prince Charlie spent the night here..
6) Taken on the top behind Mowbray Drive and shows Arnside Knott in the distance. 7 and 8) Vicarage Lane.